Purchase this product now and earn 1,790 Reward Points! 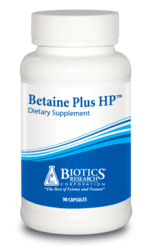 Betaine Plus HP™ is a high potency hydrochloric acid supplement, which also supplies pepsin to support digestive function. Use in instances where there is a need for additional hydrochloric acid (HCl). Capsule shell (gelatin and water). This product is gluten and dairy free.